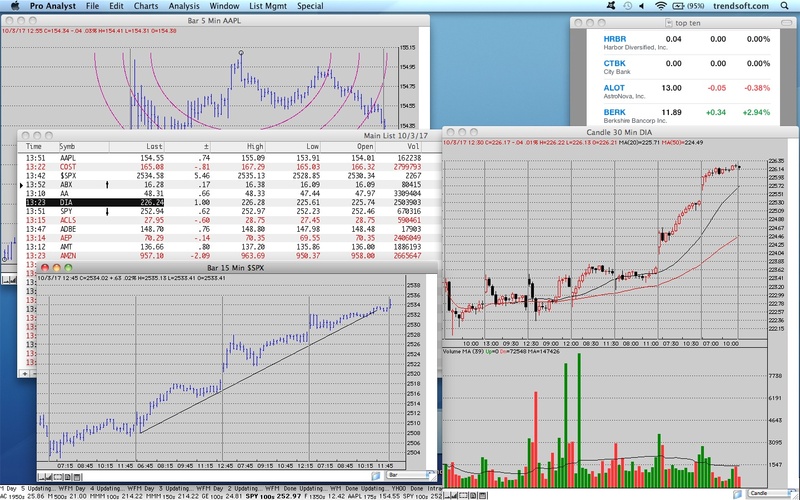 Pro Analyst...Real time, streaming quotes, graphs and analysis for the Mac! Pro Analyst brings each market to life with an easy-to-read quote monitor, personal ticker tape, headline news, and easy-to-follow graphics all updating with live, streaming, real-time data. Custom layouts "remember" every aspect of your personal design. With unlimited charts per layout and dozens of indicators per chart, the combinations are endless. Shift from one layout to another instantly. Pro Analyst will get you from point A to B to C before the competition has even warmed up. What good is real-time data if you have to wait to display it? Fast, reliable, precise intraday charts that update as the market moves, regardless of time frame, allowing you to react as conditions change. Over 40 technical studies, custom layouts, news, personal ticker tape and more. Track your choice of symbols, stock, futures, options, ETF and FOREX, trade by trade, minute by minute as the action happens, like having your own personal seat on the exchange! Over 40 technical indicators can be applied to line, bar and candlestick charts. Designed by traders for traders, Pro Analyst provides utility beyond comparison. Beyond simple charting, Pro Analyst includes intelligence features like our DayTrader system, automatic trend identification and candle pattern recognition. No other program with this much power and sophistication has ever been this easy to set up and use and...Pro Analyst makes real time really affordable. Easy to use, fast, reliable and precise, everything you'd expect from a package developed exclusively for the Macintosh. Whatever trading objectives you'd like to reach, Pro Analyst puts them firmly within your grasp. any version of OS X including macOS Mojave (10.14), the latest from Apple. © 2018 Trendsetter Software, Inc.